If you are a true Doctor Who fan that wants it all then you are in luck as there now is a mid-era Doctor Who figure set. 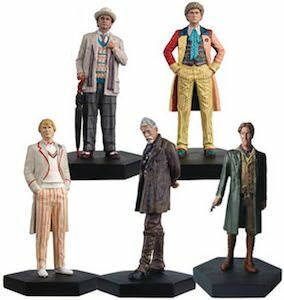 Normally you get mostly Doctor Who items based on the latest Doctor but now you can get figures of some of the classics. The set includes Doctor’s 5, 6, 7, 8, and even the war doctor. And every Doctor has the perfect pose and comes with it’s own base so that you can place them all over you home. So if you are a true Doctor Who fan then this figurine collection is something you really need. If you are a Doctor Who fan in need of some fun Doctor Who buttons then this is a got set to start with. This button set has 13 pin back button with a diameter of 1.25 inch. The first 11 buttons are easy to guess. 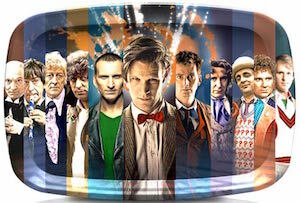 Yes each Doctor has it’s own button but only up to the 11th Doctor. And a set of Doctor Who pins of course need one with the Tardis on it to so that is included as well and so is one with the Doctor Who logo. So now you can have the perfect set of Doctor Who buttons to get you started. Jackets, bags and other fabrics can all use a fun button on it. Don’t wait come get your own Doctor Who 13 Pin Button Set. If you are looking for a perfect serving tray then why not a Doctor Who one? This serving tray is based on the 50th anniversary year and shows 11 Doctors from the 1st to the eleventh and yes the 11th Doctor is standing in the middle because bow ties are cool. Now you can use this tray in your home to server things when you have a party or just to use to get dinner to the table. Serving trays are so handy and this Doctor Who one even lets you move around Doctor Who merchandise. So if you have serving to do or planing a party then come get your own 11 Doctor Who’s Serving Tray. We all read books it could be for fun, school or work but we have to read somethings and how do we keep track at where we are? A bookmark is the answer and this Doctor Who bookmark is the one you should have a closer look at. This bookmark shows the Doctor 11 times. Yes on this bookmark you can see Doctor Who from number 1 to number 11 all in photo’s next to each other. So the bookmark looks stunning and to make you life even easier they gave this bookmark a tassel so that you can keep hanging that out of you book to easily find the page you are at. School work, office work or just a fun book they all deserve this Doctor Who 11 Doctors Bookmark. Every Doctor Who fan has it’s favorite Doctor and now you can ask people who’s theirs is. On this t-shirt it shows a picture with Doctor’s 1 to 11 and above that the text “Who was your Doctor?”. 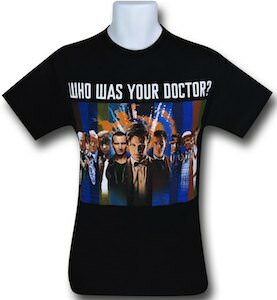 The Doctor Who t-shirt is black to make the doctor’s stand out nicely and now you can pick. This t-shirt is made from soft 100% cotton and comes in men’s sizes Small – 2XL and yes it would look great on women to. Lets get the question out there by simply wearing this Who Was Your Doctor? T-Shirt. The Muppets like Doctor Who to and that is why they decided to all dress up as their favorite Doctor and pose for a calendar. 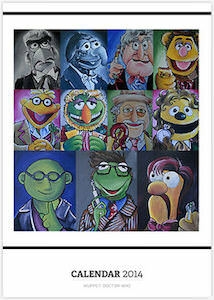 So now you can have Doctor Who calendar that has Muppets dressed up was their favorite Doctor. And the fun things about this Doctor Who wall calendar is that it start when you want. Just select the month you want it to start at and you will have 12 months of fun Muppets dressed as Doctor’s. And yes of course Kermit is there as the 10th Doctor and Beaker is the 11th Doctor. You just have to come see what Muppet is what Doctor. So check out this Doctor Who Muppets Calendar. Now you can own an amazing Doctor Who coaster set. 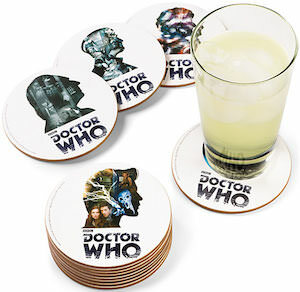 The set has 12 coasters and the first 11 you will see a Doctor and on the 12th you find the Tardis. The Doctor’s coasters show a side silhouette of one of the Doctors and in this silhouette you can see pictures from their adventures. Like the 11th Doctor’s coaster shows Amy, Rory, River Song, Dalek and the Silence. The Doctor Who coasters are made from a wood composite with a cork back. So with coaster like this there are just no glass marks on tables any more and 12 coasters means that you can have a big Doctor Who party. Come check out the pictures of all the Doctor Who Coasters. Traveling in time and space makes knowing what time it is a bit difficult but for us humans the Doctor got us this clock. This Doctor Who wall clock shows the Tardis in the middle and 11 Doctors around it. Each hour has a Doctor, the 1st Doctor is at one all the way to the 11th Doctor on 11 and then on top it says “Doctor Who”. The Doctor Who clock is 12 inch in diameter and is made from glass. The Doctor Who clock run on 1 aa battery witch is not included. 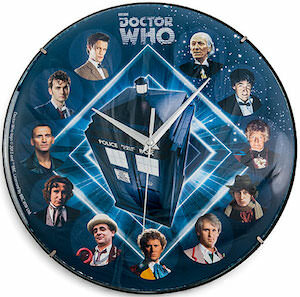 So lets find out what time it is with this Doctor Who 11 Doctors Wall Clock. The 8th Doctor did not get to much air time but still he is a real Doctor Who. And now you can have a bust mug from the 8th Doctor in your collection of coffee and tea mugs. 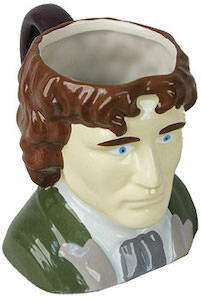 This Doctor Who mug is shaped just like the head of Paul McGann with all the details we know about this Doctor. Maybe it’s time to start collecting all the Doctors as coffee mugs so that they can stare at your from the cupboard. Now is a great time to go shop for your next coffee mug. Come and get your Doctor Who 8th Doctor Face Bust Mug. We already showed you Doctor Who Christmas wrapping paper but a Doctor Who present also needs a gift tag. Now there is the perfect Doctor Who gift tag for you holiday presents. 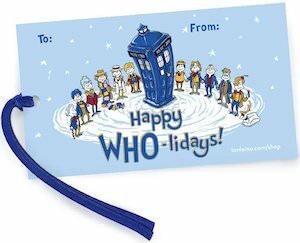 The gift tag is light blue with snow in the air and 11 Doctors around the Tardis with snow on the ground and K-9 to keep them company. And then it of course has the the “to:” and “from:” and the text “Happy WHO-lidays!”. And because you have more then 1 present to give the gift tag comes in a pack of 10 so plenty to go around and each has a blue ribbon to attach it to the presents. Come and start wrapping the presents and marking them with these Doctor Who Holiday Gift Tags.